The picture of this sweater really doesn't do it justice. In the picture it almost looks cheap. 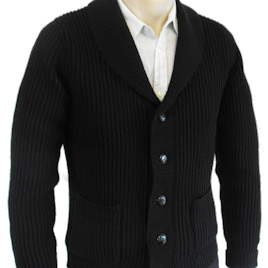 I decided to go against the product picture and trust in the great reviews of Magnoli Clothiers and buy the sweater. The sweater manages to capture the understated elegance of the on screen version. No detail was overlooked and the sweater is beautifully crafted. Best of all the fit is perfect. I did the measurements myself simply following the online instructions and I received a beautifully fitting garment. This will definitely not be my last purchase from Indy.